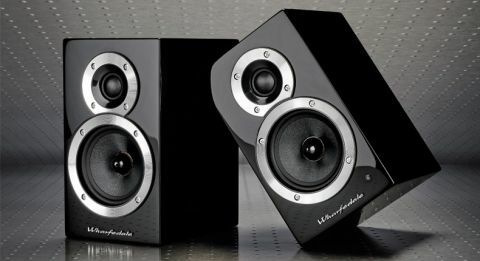 Wharfedale DS-1 review | What Hi-Fi? The Wharfedale DS-1s are what we’d call the ideal desktop size – tiny. They look like miniature versions of the Award-winning Diamond 220s. They also benefit from their siblings’ hi-fi pedigree. These DS-1s have a mature presentation that gives them the upper hand against budget rivals such as the Sond Audio Actives and Edifier R1700BTs. They may be small in size, but they produce a thoroughly grown-up sound. The tonal balance is wonderfully even – there are no spiky edges to the treble, nor does the bassline boom or trundle along with undue weight. As they’re physically small, we’re hardly expecting a huge, expansive spread of sound. However, the dinky DS-1s do go fairly loud when the volume is cranked up. More importantly, they sound fantastic – especially at this price. They’re detailed and agile, with voices firmly placed in the centre and instruments spaced cohesively in a well-balanced soundfield. We could spend hours listening without ever losing interest. The bassline in Beck’s Where It’s At is taut and nimble, with the hand-claps having just the right amount of bite to drive the rhythm along. Stream Mazzy Star’s Fade Into You from Spotify, and the delicate vocals are crystal clear and expressive. The guitar strums are wrapped in subtle harmonies, although we can’t help but want a bit more punch and enthusiasm to the DS-1s’ dynamics. Things can sound a touch too mature at times, and we’d urge these speakers to have a bit more fun. While rivals, such as the Edifier R1700BTs, aren’t as articulate as the DS-1s, they do have a lively, fluid presentation that’s endearing and comfortable to listen to. It’s a small grumble, however, compared with just how capable and detailed the DS-1s are at this money. We like how smart these petite DS-1s look. They stand just 19cm tall – small enough to fit right next to your laptop. The build is sturdy, and the finish is impeccable in either gloss black or white. There are no grilles covering the drivers, so be careful you don’t poke the tweeter. All the controls are at the back of the master left speaker. Having to reach over to twiddle the volume button can be a pain at the beginning, but it becomes second nature after a while. Wharfedale keeps it simple with just Bluetooth streaming (of the higher quality aptX variety) and a 3.5mm input for hardwiring music players. They’re NFC-enabled, too, so if you have a compatible smartphone, just tap the device to the top of the left speaker for a swifter connection. It has also kept the fascia clear of any controls or dials, which is a smart decision. There’s only a bright LED at the bottom to indicate if you’re using Bluetooth (blue) or the 3.5mm input (green). There’s no remote, so you have to press buttons on the back panel to switch between inputs and to put the speaker into Bluetooth pairing mode. While rival speakers find and pair automatically, it’s an extra step that, thankfully, you won’t have to do too often. They look smart, they sound terrific, and they cost just £130. It’s a no brainer, really. If you’re after small desktop speakers with Bluetooth streaming at an affordable price, you can’t go wrong with the Wharfedale DS-1s. Their well-balanced and articulate performance is a steal at this price. We urge you to give them a listen.